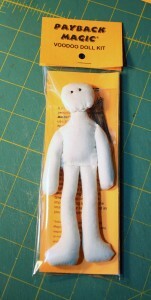 In my never-ending quest to get the studio straightened out, I came across a doll I bought years ago from a craft store. 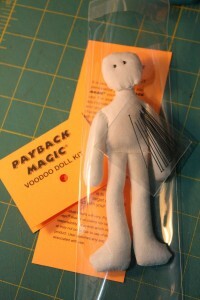 I’ve used these in the past to make packaged voodoo dolls as gifts for friends. I decided it was time to make another. I found the original “packaging materials” on my computer, but figured it was time to change the design a bit. I also added some wording about propping it up next to the cutting board next time you chop onions (why not?). 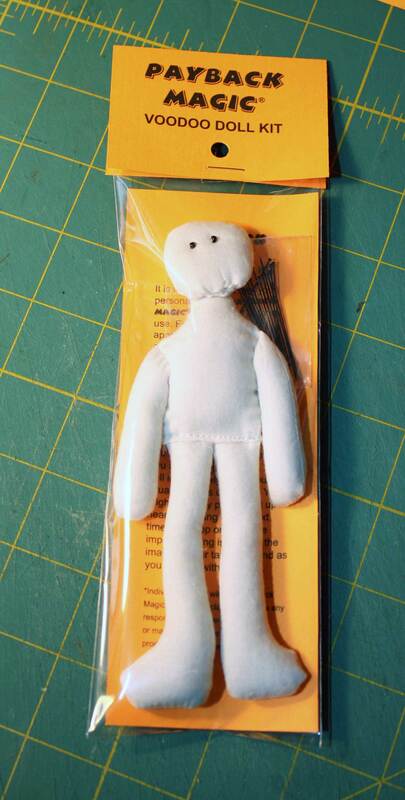 And even though I’m not planning to sell these or make it a commercial item, I put a new “product name” on the label after discovering that my original choice is, of all things, a registered trademark belonging to Dow Chemical. 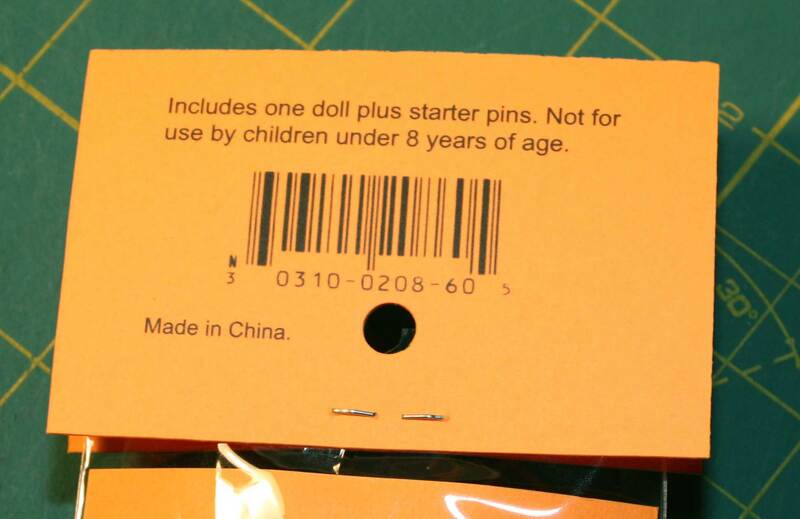 On back, I added a description of the contents, a bar code, the obligatory “Made in China” and a warning about use by children. I thought it added a nice authentic touch. I have some narrow sleeves that were originally intended for bookmarks. And I have some other, tinier sleeves just perfect for a few starter insect pins. Voila. 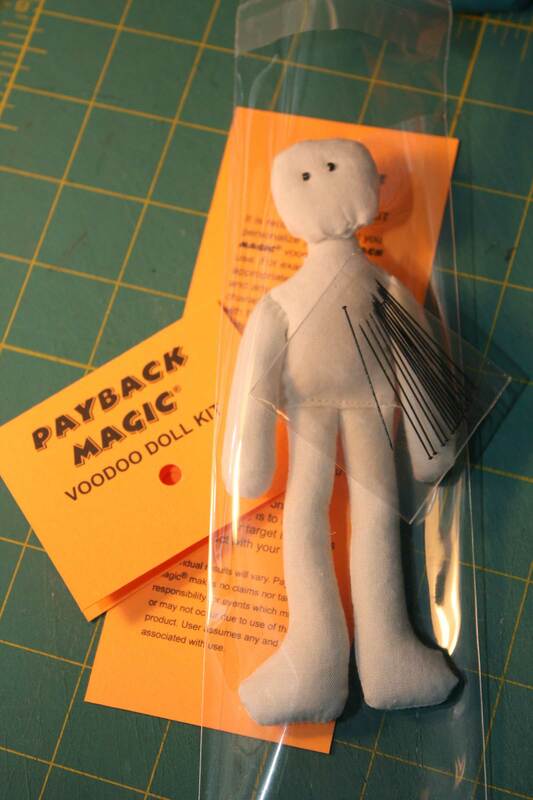 A finished Payback Magic Voodoo doll that almost, indeed, looks as if it could’ve come from a tacky dollar shop.